The Chloe Zee Foundation was set up in honor of how Chloe loved and lived life to its fullest. The Foundation helps other families and individuals that have been struck with cancer, families that have children with life threatening diseases, Chloe’s Annual Scholarship, The Central Florida Make-A-Wish Foundation and The Florida South Ronald McDonald House. 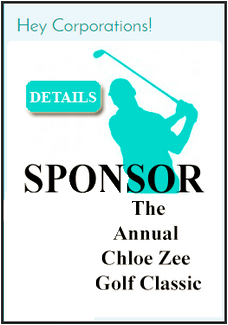 There is a Annual Chloe Zee Memorial Golf Classic the last Sunday every year in September at Heathrow Country Club. All of the proceeds raised go to these wonderful causes. Thank you Todd Gregg and all involved with CarFax. Thank you for creating this website for us! You guys rock! Copyright © 2019 Chloe Zee Foundation.